4G | 5,500 sq. ft. The zBoost TRIO Xtreme REACH solves missed and dropped calls and slow LTE data inside your home. The ZB585X-A boosts signal for AT&T 4G LTE data as well as voice and text for all major carriers. The zBoost ZB585X-A captures the marginal-to-reliable cellular signal you have outdoors and rebroadcasts it indoors, up to 5,500 square feet, so you can enjoy clearer, faster and more reliable service without interruption. No more dropped calls, lost connections, and slow internet. Perfect for SOHO (single office, home office), large cabins, cottage, and other businesses. You need reliable talk & text and high-speed 4G LTE internet for the entire house or office. You can’t deal with dropped calls, fish tank voices, stuck text messages and slow internet. Get the signal you deserve for dependable connections and clear calls with a high-powered amplifier exclusively made for AT&T. The zBoost ZB585X-A Trio Reach Xtreme signal booster amplifies talk & text and 3G for all major carrier networks except WiMax and iDen. 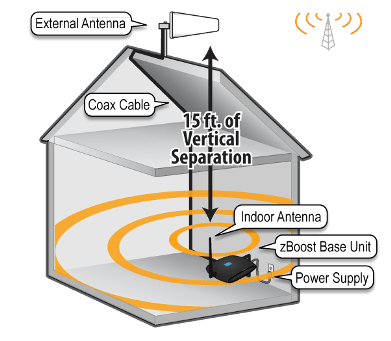 It works by pulling in the existing weak signal with the outside antenna, amplifying it multiple times with zBoost’s award-winning amplifier. The enhanced signal bypasses all exterior and interior obstructions and interference directly to your entire home.